In what has become our long standing tradition on the Monday following the race, Dave drove us over to the IMS Museum for my yearly visit. Guessing we must have been somewheres' near Downtown? Since Dave noted how that's Odd? What's the Penske Racing Team's Semi-hauler doing pulling out of the J.D. Marriot? Hmm? May be they're dropping off Will Power's Indy 500 winning mount for the Banquet? Which is exactly what was happening. R100: Touching Three Awesome Racecars! As this year's exhibit features the legendary Unser's, presumably the only Family to have three multi-Indianapolis 500 winners in its ranks, with the amazing tally of nine Indy 500 victories! 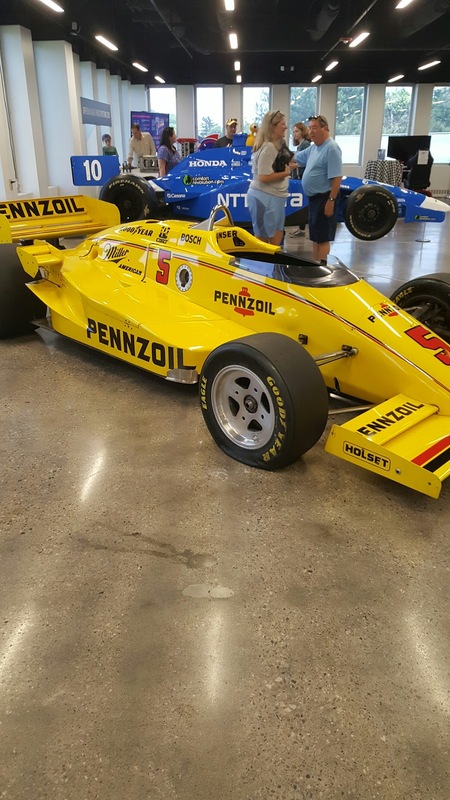 As I swear All nine of the Unser's Indy 500 winners were On-hand, although Jim Ayello's article notes that just eight of the nine were present. But then again, Hmm? Cannot seem to remember if 'lil Al's Galmer chassis was there? With three of B-I-G AL's four winners grouped together, while the other PJ Colt Johnny Lightning chassis was off in an original Gasoline Alley Garage diorama. Thought 'Ol "Uncle bobby's" three winners were side-by-side? Since all I remember is CARPETS' telling me the cars were autographed - before asking me what's Olsonite? Which is funny since I've got a 1:18 Diecast replica of that bone white Eagle chassis that Bobby Unser won the Pole at Mother Speedway aboard. And I really liked the new Display Cases, which apparently were recondition from the 1930's? Even if I couldn't see anything inside them. As there's countless great trinkets, trophies, helmets, etc spread all about the museum. Not to mention much of Thar' winnings from "Unser Mountain," aka Pikes Peak, which I think bobby won an astounding 13 times? Along with a 1946 "tow" truck pulling a racer behind it. While I'd just learned about Ma Unser's chili cook-offs during a recent Speed Freaks interview with Uncle Bobby on Mother's Day, for which the giant cook pot and canoe sized stirring paddle were on display, or pictures of said cooking implements? Although I'm pretty sure at least the paddle was Thar. this was 'lil Al's single foray into the Dark Side 'O Taxicab Land; Err Bombers, or better known simply as Stock Cars. As Al Unser, Jr. was persuaded by his "good Friend, The Intimidator," or as I prefer 'Ol Ironhead! To race in the 1993 Daytona 500 for Rick Hendrick. Junior got Spun Out during Qualifying and wrecked his primary car, whilst noting his team-mates were a rookie named Jeff Gordon, and Ken Schrader. Yet Hendrick elected to put 'lil Al into Schrader's Backup Car, hence the unusual monotone paint scheme, since Thar simply wasn't time to repaint his ride for Day-Toner. Then after Unser Jnr had wheeled the Chevy Lumina up front from 40th position; which 'lil Al claims this chassis was way Faster then his primary car! Ironically, He got the Chrome Horn treatment from Dale Earnhardt Sr., causing him to spin and be collected by other Drivers behind him - in his one 'N only NASCAR race. This iconic Porsche Endurance Sports Car, which obliterated North America's IMSA competition in the mid-1980's was purchased by A.J. Foyt enterprises, and led to much curiosity for Mwah. Especially since I'd seen other 962's raced in anger at Portland International Raceway in their waning years. Not to mention being introduced to these iconic Porsche racing cars when given a large poster of my local racing team Bruce Leven's Bayside Disposal's #86 962 with a female model in Bathing Suit sporting Sun glasses in front of it! The car was raced by SuperTex', 'Ol Hollywood and Big Al', nee A.J. 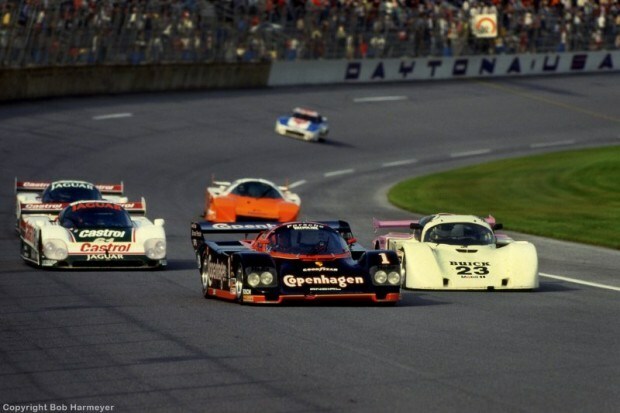 Foyt, Danny Sullivan and Al Unser to fourth place in the '87 24 Hours of Daytona. 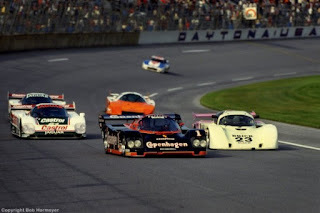 The following year, 'lil Al, aka Al Unser, Jr. replaced his father and co-drove alongside Foyt and Elliot Forbes Robinson to sixth place overall in the Daytona 24hrs event. The car is resplendent in the iconic black Copenhagen colours Foyt campaigned for years. But oddly, according to my personal museum Sherpa CARPETS', also strangely sports Hurley Haywood's name upon it's door sill, for reasons unknown. Although it's not a Bad thingy' having Hurley's name adorn this beautiful Porsche 962 Customer example, especially since he's a legend of the 24 Hours of Daytona. Currently tied with Scotty Scooter' Pruett for most Overall victories, with five apiece. Whilst some clever Hack's jibe of "Night Terrors and SuperTex" at Daytona certainly grabs one's Attenzione, Eh?